With an impending storm on the horizon, wind whipped through the flag silks of every corps' color guard, as 10 of Drum Corps International's World Class corps competed at the Glassmen All Star Review, Sunday, June 23, at Bowling Green (Ohio) State University. Wrapping up the first weekend of the 2013 DCI Tour, each one of the corps had previously competed this season, but not a single event yet this summer allowed fans to enjoy such a large number of World Class corps in one place. Coming off a strong performance in Akron, Ohio on Saturday and a first-place finish in Belvidere, Ill. on Friday, the Cadets triumphed in Bowling Green, earning a score of 75.60. 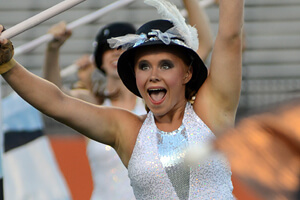 Just as it did on Friday, Phantom Regiment (73.90) came in second, chipping away at a 2.8-point gap in Belvidere, to finish 1.7 behind the Cadets in Bowling Green. "We pretty much knew we were going to be ready and off to a strong start this season," Cadets Director George Hopkins said. "We knew we were ready, except for the last piece, which we got done a couple days before the season." Hopkins said that the Cadets have plenty of work to do on their production, "Side By Side," in the coming days and weeks. "Right now the show is about one minute over [regulation] time," he said. "30 seconds of transitional stuff that we can clean up quick, but the other 30 seconds we've got to work on. Right now we're evaluating what really doesn't work compared to everything else, and to see if we can make a 30 second cut in what we've already got on the field." Madison Scouts (70.15) finished in third place, followed by Boston Crusaders (69.50) in fourth. The Scouts' 2013 production is one that highlights the corps' history as they celebrate their 75th anniversary this year. 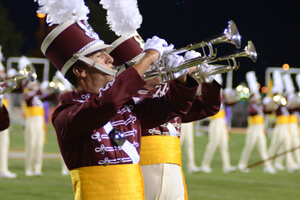 Drum Major Sean Hadley said that to him, the show's message is what makes it powerful. "The title really sums it up: '75 Years of Survival, Corps of Brothers.' That's really what we are," Hadley said. "150 guys every year come together, and exemplify it. Every single one of these guys is my best friend, and especially with '[You'll] Never Walk [Alone],' that we play at the end, it's really a message of solidarity." Spirit of Atlanta (68.35) took fifth place, passing the Cavaliers (6th, 68.20) by a slim margin of .15. The Blue Stars (65.15) took seventh place and the Crossmen (64.20) eighth. The Troopers (61.50) found a spot in ninth, with Pioneer (51.50) rounding out the competition in 10th. Troopers' score in Bowling Green was almost 2 points better than the day before in Merrillville, Ind. Drum Major Justin Anderson expressed his satisfaction with his corps' improvement so far, even just five days into the DCI Tour. "[It was] definitely the best of our three [competitive performances] so far. I think the crowd definitely loved it and I think the members are extremely proud," he said. Five of the corps featured tonight in Bowling Green (Cadets, Phantom Regiment, Boston Crusaders, Spirit of Atlanta and the Cavaliers), plus the Bluecoats can be seen in the "DCI Tour Premiere," which hits movie theaters nationwide on Monday, June 24 at 6:30 p.m. The cinema event includes performances recorded at the Innovations in Brass DCI Tour event on June 22 in Akron, Ohio. Learn more about the "DCI Tour Premiere." View a recap of all scores from Bowling Green.